If you're craving hamburgers and all you've got are some frozen patties and a microwave, don't resign yourself to a trip to a fast-food restaurant. You can whip up a tasty, healthier meal in just a few minutes in your microwave. While cooking hamburgers in the microwave won't impart the same taste as frying them or cooking them on the grill, it's still a viable option if you don't have another way to cook them or simply need to put a meal on the table quickly. 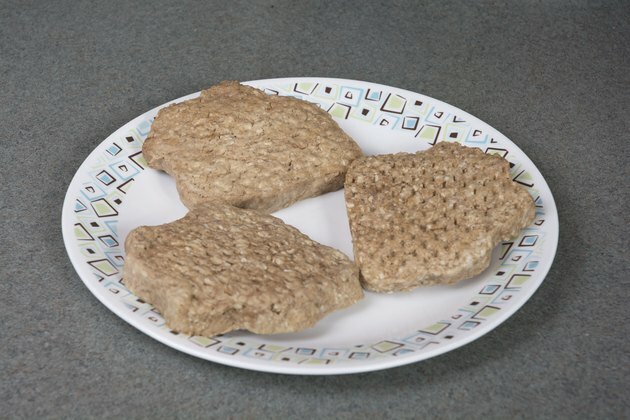 Arrange frozen hamburger patties on a microwave-safe plate or dish. Placing the meat in a circular pattern will help it cook faster and more evenly. 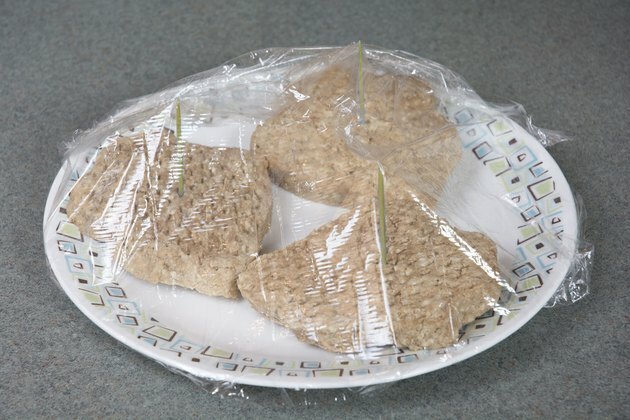 Cover the hamburgers with a microwave-safe casserole lid or plastic wrap. Don't allow the plastic wrap to touch the patties. Prop it up with toothpicks firmly stuck in the meat and cut a small hole to vent the wrap slightly. Covering the meat helps it retain moisture during the cooking process. 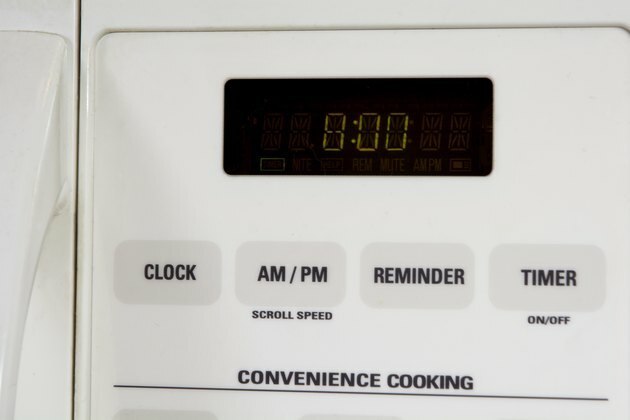 Set your microwave to high or medium-high power and cook the hamburgers for five to eight minutes. Rearrange the hamburgers on the plate or in the dish, moving the patties on the edges to the center. There is no need to stop and rearrange if you're only cooking one or two patties. Continue cooking the meat for several minutes until the burgers are steaming and the juices are running clear. The exact time it takes to cook hamburgers in the microwave varies because all microwaves cook differently due to wattage and efficiency variations. The more fat the ground beef has, the faster it will cook, though lower-fat hamburgers are preferable for nutrition reasons. Allow the hamburgers to sit covered in the microwave for at least two minutes once you think they're done to let them finish cooking and reach a stable internal temperature. 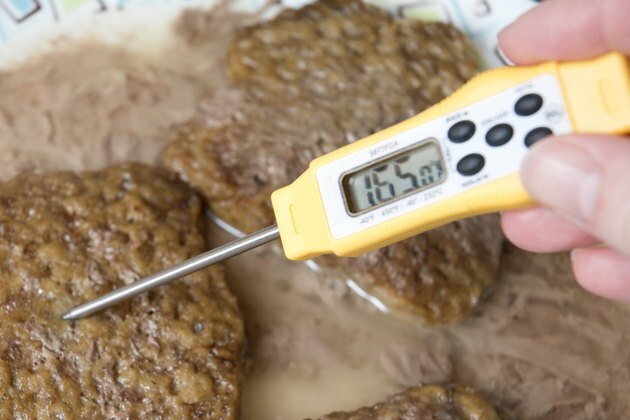 Check the temperature of your hamburgers with a food thermometer. Ground beef must have an internal temperature of at least 165 degrees Fahrenheit to be safe for consumption. Check the temperature in several places of each patty since microwaves can sometimes cook the edges well but leave the centers still undercooked. Defrosting and then cooking the meat in the microwave will result in a higher-quality burger. 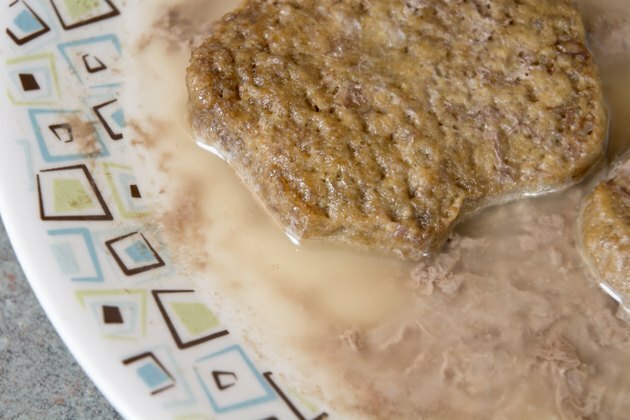 Set your microwave to low power or the defrost setting if it has one and defrost the patties for several minutes, or use your microwave's setting for defrosting hamburgers or ground beef. Cook the meat immediately after defrosting. Reduce fat by microwaving your hamburgers on a microwave-safe trivet or in a microwave-safe colander to allow the fat to drip through to a plate below. 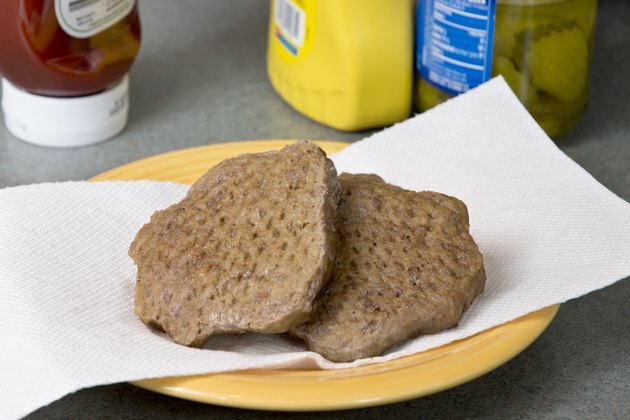 Hamburgers cooked in the microwave might not look as brown as you're used to seeing. You can add color by adding a sauce such as teriyaki or Worcestershire.